Melanocytic neoplasms of the conjunctiva include nevus, primary acquired melanosis (PAM) without atypia, PAM with atypia, and conjunctival melanoma. The most common nonmelanocytic tumors of the conjunctiva are squamous cell neoplasms. Surgical excision is the cornerstone of therapy for conjunctival tumors. Proper specimen handling is critical to ensure that lesion orientation is clear to the ocular pathologist. Adjuvant therapy for conjunctival tumors can include cryotherapy and/or topical chemotherapy with mitomycin C, 5-fluorouracil, or interferon, or adjuvant radiation therapy. 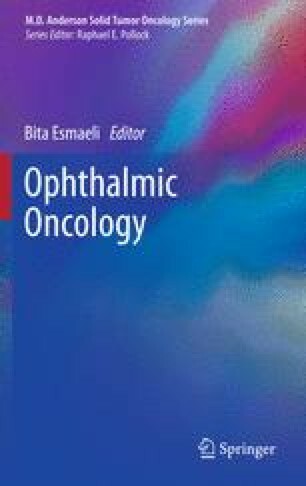 Tumor thickness and ulceration are important prognostic factors for local control and survival for conjunctival melanomas. Sentinel lymph node biopsy is an important recent consideration for conjunctival melanomas that are thicker than 2 mm or those that have histologic evidence of ulceration.